I was delighted to be invited to, and able to attend, a very nicely organized Ukrainian-Irish wedding. I really enjoy weddings with numerous special traditions, intertwined with the typical wedding traditions, such as the cutting of the wedding cake, the garter and bouquet tossing, the mother-son dance, the father-daughter dance, etc. I also like to photograph special decorations, the wedding cake, and other items that make the wedding different from all the rest. This wedding also included many special rituals, practiced on many Ukrainian and Irish weddings. I am very grateful to The Master of the Ceremony, who so kindly offered to share his copy of the explanations of these different rituals and blessings, which I could share with all of you. The top picture in this post is the display of the Greeting Bread, The Korovai, Holy Icons, Periwinkle Wreaths resting on an embroidered pillow, and gorgeous embroidered scarfs, “rushnyky”. All these items have been used during the wedding ceremony and reception, and become keepsakes for the Bride and Groom. This display is in front of the head table of the Bride and the Groom, and the whole Bridal Party. The Periwinkle Wreaths (or crowns in some churches), are placed on the heads of the Bride and Groom, during the Crowning Ceremony. These wreaths represent love, purity, and fertility. They are a symbol of dawn of the new kingdom to be ruled, side by side, by the newlyweds from this moment on throughout their married life. The pillow for the periwinkle wreaths, was embroidered by one of the Groom’s sisters, specifically for this special occasion. 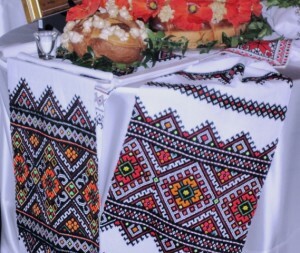 The Korovai and the Greeting Bread was baked by the Groom’s 90 year old great-aunt, who also baked 6 beautifully decorated traditional Ukrainian Tortes, for the wedding reception. The Korovai decorations (love birds, cones, Tree of Life branches) were created by the Groom’s sisters, who also assembled this whole Korovai. The Groom’s mother was very proud of her Ukrainian heritage, and its rich culture. She was passionate about Ukrainian embroidery, so I just had to capture a close up view of the intricate work on these embroidered scarfs (towels)- Rushnyky, displayed on the Korovai table. Part of the wedding reception rituals was a traditional wedding gift giving to the Bride and the Groom. 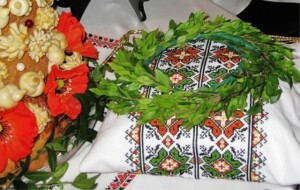 These traditional gifts, would not be so traditional at a non-Ukrainian, or non-Irish wedding, but in this culture, they represent a long-standing tradition of bestowing gifts upon the Bride and the Groom on their Wedding Day. Gifts can come in all forms, such as best wishes, friendship, homemade gifts, or store-bought gifts. Some of the best traditional gifts are passed on from generation to generation. Ukrainians and Irish have many such treasures to share, so I will share some of these with you, and include short captions of their symbolism. Honey – is sweet as the love that binds the new couple. They will adhere to each other for support and happiness. Their sweetness will attract others to celebrate life with them. Garlic – represents health and strength. In presenting garlic, we wish them health and longevity, to enjoy many happy years together. 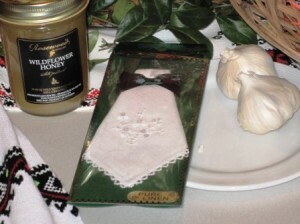 Garlic also supposed to ward off evil spirits from their home and family. by carrying this sweet hankie on your Wedding Day. 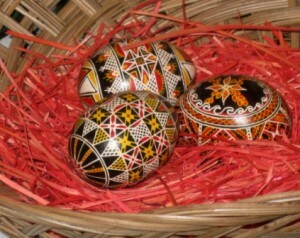 Pysanky – Hand decorated Ukr ainian Easter Eggs. The egg represents life, and new beginning. The etchings on its shell are full of decorated symbols, representing health, happiness, love, eternity, and God’s Blessing. Ukrainian Jewel encrusted Treasure Box filled with Gold Coins – 13 Gold Coins are given to the Bride as a symbol signifying that the Groom will support her. The number 13, represents Christ and the 12 Apostles. The coins hold good wishes for prosperity. 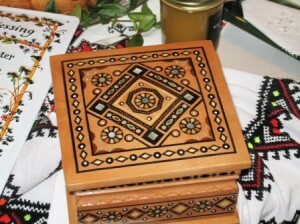 They are housed in a traditional Ukrainian bejeweled box, representing the home. There also was a bottle of Honey Wine (I did not capture it in my pictures), which was believed to be the best way to ensure a new and happy beginning for the marriage. The Newlyweds also received a traditional gift of a 10 lbs. loaf of rye bread, which they shared with all the gusts later on. This gift of bread signified well wishes of good luck, so their home and family will always have plenty of food, and never shortage of bread. 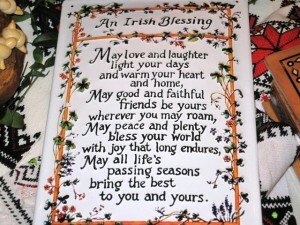 Another very special gift presented to the Bride and Groom, was this beautifully created ceramic plaque, with the Irish Blessing. I was able to get a close enough picture to display the full script. Now you know what I meant at the beginning of this display, that these “traditional” gifts are not so traditional at other weddings, yet they are very special to this couple, and add a special tough to their Wedding Day celebration, reflecting their family traditions. 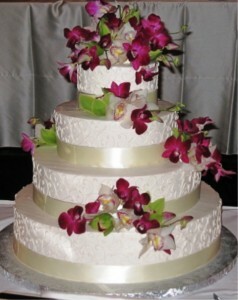 Last, but not least, is the gorgeous Wedding Cake. It looked stunning, and it was equally delicious. To support the Bride’s Irish tradition, it was made with Irish Whiskey. 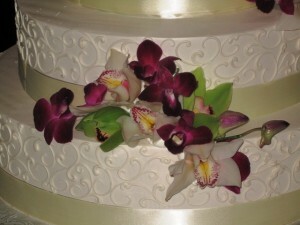 It was one of the best tasting wedding cakes I had in a long time. You know how I love flowers, and admire beautiful crafts, thus I had to share a close up view of the wedding cake decorations. Hope you enjoyed this post, and learned a lot about wedding traditions you have not heard of, or seen before. As for me, I am looking forward to another wedding, so I can take more pictures to share with you. I am always in learning about the traditions of people beyond my Ukrainian background and Polish background of my husband. I think that the weddings that have displayed their traditions are so very special. Wow…that is so special and beautiful. I would love to see a picture, and post it if she agrees to it. Thank you for stopping by, and leaving a lovely comment. My mother told me about the beautifully decorated Greeting Breads but I never saw them at any country Ukrainian wedding when I was growing up. It seemed that these wonderful old traditions were being forgotten, but then, suddenly in the 1980s, there seemed to be a revival of interest and fancy breads appeared again, especially at Easter. I have never seen any, however, as lovely as the breads in your pictures. 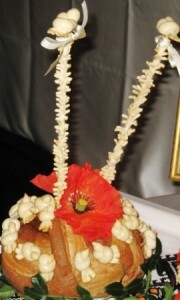 I was getting married in 1974 and we did have the Greeting Bread with the wine and salt, but I did not have a Korovai. Maybe this tradition was practiced at that time more in the US?? 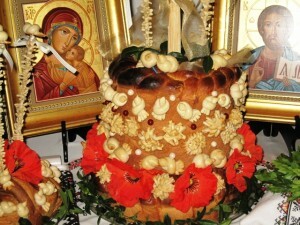 Now every Ukrainian wedding had a Greeting Bread and the Korovai. If you read my post about the Ukrainian-Greek Wedding, this one did take place in Canada, but it was a recent event. Thank you for stopping by, and leaving a comment.